I know someone who breeds exotic pets, including tarantulas. Those critters can get really big. Some are as huge as tennis balls, more or less. I might have made them larger in my mind because I have a slight fear of spiders. No, it’s not arachnophobia and I don’t go screaming like a banshee whenever I see spiders. But I do keep an eye out for them and avoid dark areas, especially when there are webs around. Tarantulas may look scary because of their size. However, there are smaller and more venomous spiders that we should be wary of, like the black widow. The black widow easily fits the description – “small but terrible.” It is a medium-sized creature with a glossy, black exterior that is sometimes marked by yellow or white. We are most familiar with the species with red markings shaped like an hourglass. Normally, the black widow does not bite humans. But when disturbed, it will. It is also pretty aggressive when hunting. You’ll see this spider quickly attacking other insects and injecting venom that liquefies the insides of its victims. Around 5 kinds of black widow spiders can be found in the US, and most of them are in the southern and western states. 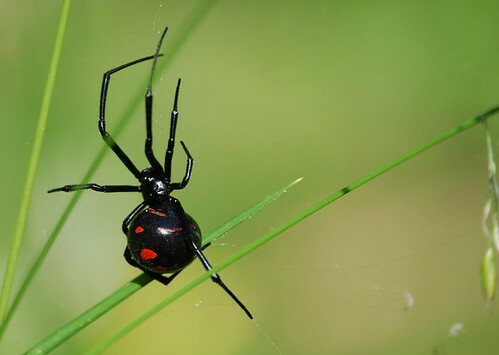 Latrodectus mactans – this is the black widow’s scientific name. This name provides a clue as to how lethal the bite of this spider is, especially to those who are extremely sensitive to insect bites. Although it is rare for a black widow to cause human death, its bite can have a devastating effect on health. For one, it causes a medical condition called “latrodectism.” Someone who has latrodectism experiences severe pain or agonizing muscle spasms. The severity of the black widow’s bite can be classified into 3 levels. Someone who suffers a mild reaction to the bite will have pain on the site of the bite, and some swelling or redness. All his vital signs, heat rate, temperature, and respirations, are normal. In moderate envenomation, the person feels pain not only at the area of the bite, but he’ll also feel it spreading through his entire extremity. For instance, if he was bitten on the right hand, he’ll experience muscle cramps on his entire right arm. Sometimes, the pain will radiate to the abdominal area or chest. The area near or around the bite will appear sweaty or diaphoretic. Generally, vitals signs will still be in the normal values. The reaction is severe once a victim experiences widespread and profound muscle pain and sweating. Headaches, nausea and vomiting are also common. The person will have abnormal vital signs as well. Latrodectus facies may occur, which is the swelling of the face. Hypertension and mental stimulation also occurs. At this stage, it’s vital for a person to receive emergency care to avoid possible death or other serious neurological complications. Keith T. Robinson. “Black Widow”. February 7, 2009. Online image. Flickr. December 21, 2012. Claire Brent is a freelance writer. She’s a homeowner who likes home improvement and gardening, which is why she’s had many encounters with a variety of pests. She blogs about her experiences, covering topics like spider and termite control. She also provides material for Preventive Pest, a company that offers excellent pest control services.